You’ve probably heard of heaven on earth, but how about heaven on a plate? Little Slice of Heaven Cheesecakes promises just that, in 67 flavors and counting. Every cheesecake is lovingly handmade from scratch, and the cherry, turtle, and chocolate chip recipes have been passed down for three generations, so you know they’re something special. Owner Julie Higgins began selling whole cheesecakes and individual slices in Texas in 2014. In 2016, she relocated to Central Oregon and has been serving “little slices of Heaven… in Paradise” ever since. Recipes range from traditional to sublime, with combinations including chocolate chip mint, guava, caramel “pearadise” (see what she did there? ), cherry limeade, and gingered blood orange. Can’t decide on a flavor? Toasted Coconut, Chocolate Chip and Turtle are top sellers, so maybe go with the popular vote. 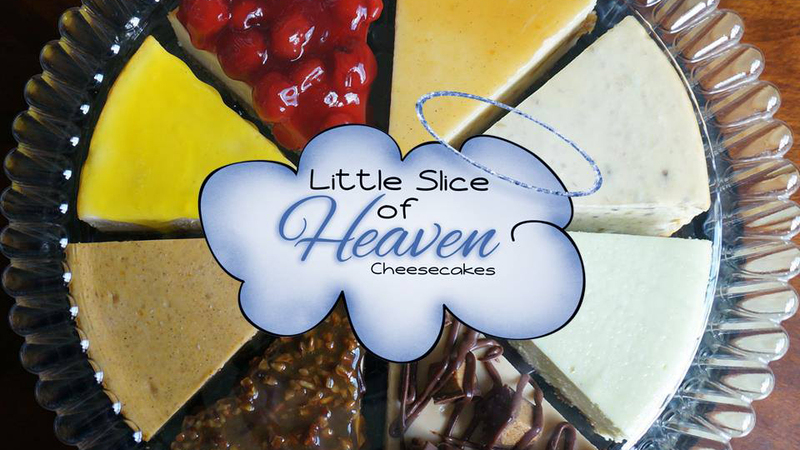 Whole cheesecakes can be ordered directly through Little Slice of Heaven with a 48 hour notice. Or if you are showing a little restraint and want just a slice, you can find an assortment at Newport Avenue Market or CE Lovejoy’s in Bend, the Sunriver Country Store, or Melvin’s in Sisters.